The knee-length yoga leggings that I made last July are one of the most-worn item that I’ve ever made. But since the weather got cold, I have gone back to wearing my old store-bought leggings. I suppose it is time to make another leggings! I have been learning more about sewing workout wear through Sew and Draft Your Own Personal 7 Piece Workout Wear Collection course that was sent to me by Burdastyle. In one of the lessons, Meg Healy (the instructor) teaches how to develop the basic leggings sloper pattern into a pair of leggings with crotch gusset. The gusset is drafted in a very simple manner, basically it is consisted of two pairs of pieces from the front and back crotch pattern. For my next pair, I want to draft the gusset in one piece instead of four pieces like this one. 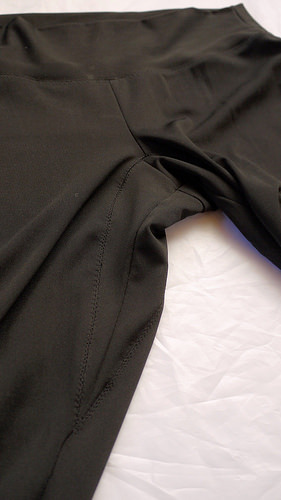 On the inside, the gusset has a piece of jersey lining to make it more comfortable. 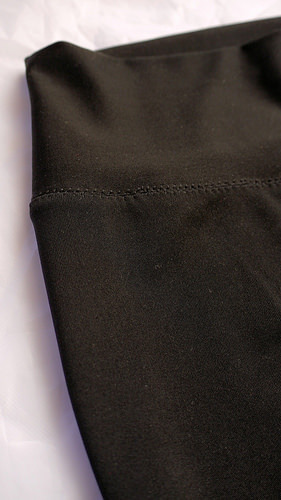 The waistband is drafted wide with folded edge on top. There is no additional elastic in the waist band so it is very comfortable. I like wide waistband like this that reaches to my belly button. 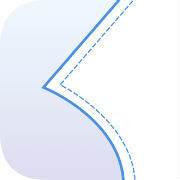 The crotch and waistband seams are topstitched with decorative stitches that look like flatlock. 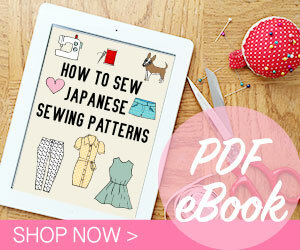 I read about this technique on Tasia’s post in Sewaholic blog. 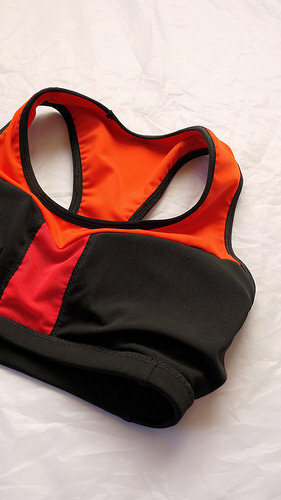 Speaking of Tasia from Sewaholic, I bought her Dunbar top pattern to make a sports bra! I use the same black spandex fabric as my leggings, carrot red spandex for the contrast, and store-bought foldover elastic. My lining is powernet in orange-red color that is actually quite thin, so I added another layer of stronger black powernet between the layers. 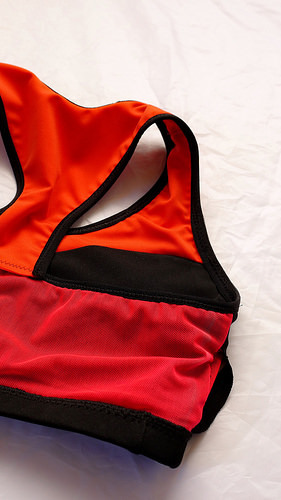 The bra cups have openings on the side for removable bra cups. 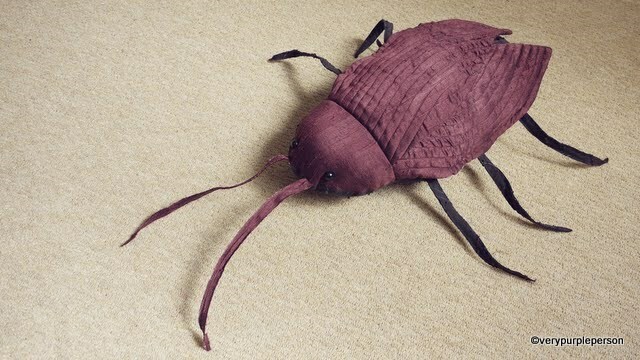 I really suggest to make a muslin if you are interested in making this bra. The bra is quite short from top to bottom. I cut size 2 and had to add 2 cm on the bottom end of each piece. The recommended elastic length for the underband is way too long for me. I measure my elastic by putting it around myself snugly and cut the desired length. When attaching the binding, I made sure to stretch the elastic binding slightly so it will fit snugly when the bra is being worn. I usually wear encapsulation sports bra with separate cups and underwire like this Panache sports bra and not the compression type like the Dunbar. The feeling is a bit different, it is much lighter. I like this one better! The bra is very comfortable, I think I want to use this pattern to make another bra in jersey fabric without the shelf bra just for lounging at home. Unrelated to the sportswear, today is my 44th birthday! I’m not sure how I feel about being 44, sometimes I feel like I’m still not an adult yet. Here is a pot of succulents that Sidra bought for me. 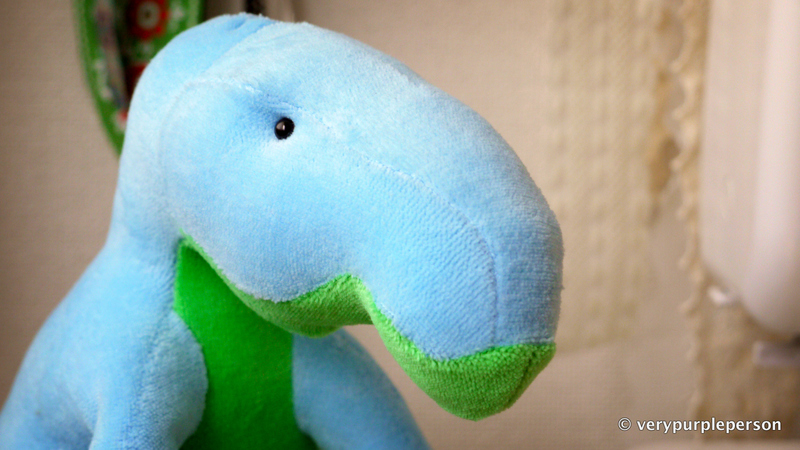 He bought it at the market near our house, but on the way home the pot got turned over. He didn’t have the chance to fix it because he had to hide it rightaway when he got home. I think it is a very endearing story. The cards are from my husband and Sidra. 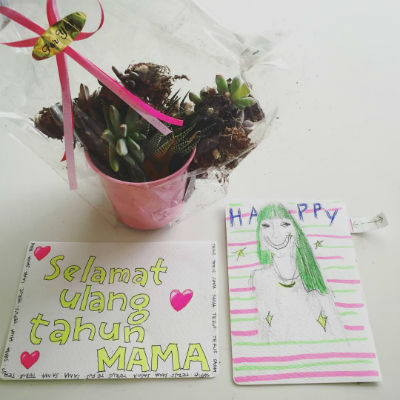 My husband wrote ‘Happy birthday Mama’ in Indonesian, and the little writing around it is something like ‘together forever’. Sidra drew me from a photo. He said that the mouth part is very difficult, so he just gave me a wide grin instead. I feel very lucky to have these two sweet men in my life at this moment! 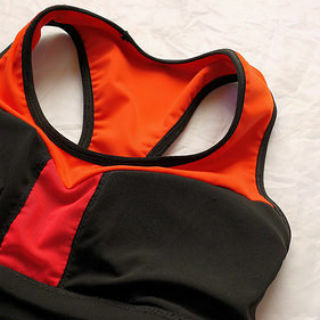 Sports bra pattern is Sewaholic Dunbar top (PDF), size 2. Leggings pattern is developed from Burdastyle knit leggings sloper (PDF), size 38 printed at 92%. Disclosure: The leggings sloper pattern is included in Sew and Draft Your Own Personal 7 Piece Workout Wear Collection course sent to me for free by Burdastyle.